between 1575 and 183 7 showing the whole of the county of Devon on either one or two sheets. Although this omitted Ordnance Survey sheets and those atlases designed on a sheet basis, this meant that we were still able to list 117 different maps along with their sources and provide information on the people behind them. This site is the internet version of the revised Second Edition of The Printed Maps of Devon. Since the original work was published (now out of print) more maps have come to light and new information discovered so that the present work includes a total of 119 different maps incorporating over 300 states (i.e. including variations) and references nearly 1200 sources of atlases and maps. These are all included here in this site. Furthermore, as the authors are no longer restricted to the A4 format, we have been able to include extra information on many of these issues. Interested users of this site are invited to contribute new information and new states or even new maps. Moreover, in the course of our researches we may have omitted something, overlooked a source or falsely interpreted our notes. We apologise for any errors and welcome correspondence and corrections from fellow enthusiasts and collectors. Please note that the sequel to Printed Maps is now available on-line. The Victorian Maps of Devon in an up-to-date revised second state can now be accessed by clicking this link. It is planned to add further sites in the future: the work of John Cooke of Plymouth and The Printed Maps of Exeter. So watch this space! At a recent auction I was able to obtain a copy of the exceedingly rare version of Van den Keere's map of 1648 but issued much later by Van der Aa in 1729. At the time I wrote the Printed Maps I was only aware of one copy of La Galérie Agréable Du Monde (at the British Library) and was unable to obtain an image. I have now discovered that the National Library of France has a copy and the complete atlas is available on-line. The map has an added frame: but note the lack of symmetry. The right hand side does not match the left. It is as though the printer had various blocks for framing and added two at random. At the end of the 1980s as a budding map collector I contacted a dealer who had some maps of Devon for sale. Unfortunately the maps had already been sold to “another Devon collector”. I asked that my name and address be forwarded to said buyer and some months later received a message from Francis Bennett. At the time I had naively set out to compile a “Stanley Gibbons” of Devon maps and had used my PC skills to produce a mock-up including information (gleaned from other’s work) on roughly 80 maps of Devon. The letter from Francis was business-like but not exactly encouraging. Nevertheless I persevered and forced a meeting on the poor man. When I showed him what I had produced so far he was immediately supportive and from that moment I had a friend as well as a contact. Although I visited Newton Ferrers too infrequently I was warmly welcomed and I had many hours when I was able to enjoy his company. His picture is pinned to the wall above my desk in my map room; Francis interviewed by the Evening Herald after the publication of the first of our two books on Devon maps. In many ways this is how I will always remember him; sat in his study surrounded by maps and books, eyes alert but friendly, and wearing the omnipresent baggy pullover. The books and the two websites Printed Maps and Victorian Maps would not have been possible without Francis’ tireless legwork. While I sat in front of my PC (in the beginning an old Amstrad! 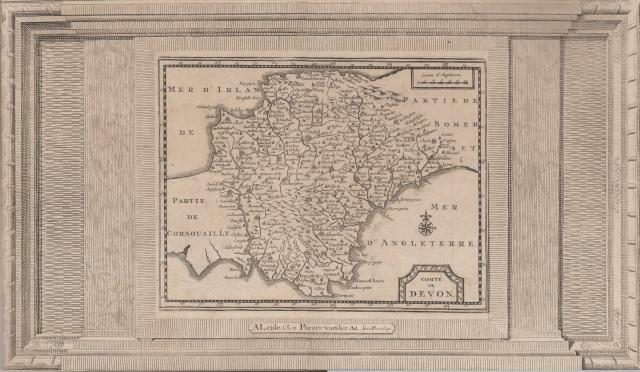 ), Francis would visit all the institutions in Great Britain searching for maps of Devon. However, he soon taught himself computer skills, bought a PC and we would exchange 3 ¼” disks through the post. He was the methodical, analytical brain and I was the fast and furious text writer; consequently errors would appear – all of my making. Nevertheless, I am sure that Francis was immensely proud of our two books, as he rightly should have been. They still represent the only county bibliography covering the complete period from 1575 to 1901 which is fully illustrated. He then proceeded to write two books of his own that he might never have attempted without this impetus. Illustration copyright Evening Herald - April 2nd 1996. After completing six books / monographs on Devon mapping I am beginning to sell off my collection. If you see any map or atlas with "KB" as the source (extreme right of listing) then I have this in my collection. If you are interested in buying, let me know! In addition I have a new site where I will list maps from my collection for sale. for a short list of maps currently on sale. If you can see from my two web sites - Printed Maps of Devon and Victorian Maps of Devon that I may have a map of interest to you, feel free to send me an enquiry or to make me an offer. The SEARCH function below will help to locate pages. This search engine also finds parts of words so use full words if possible. (Please ignore the "Ad" Founds, in the Searchresults).